into simple practical tools for growers to use for disease control. 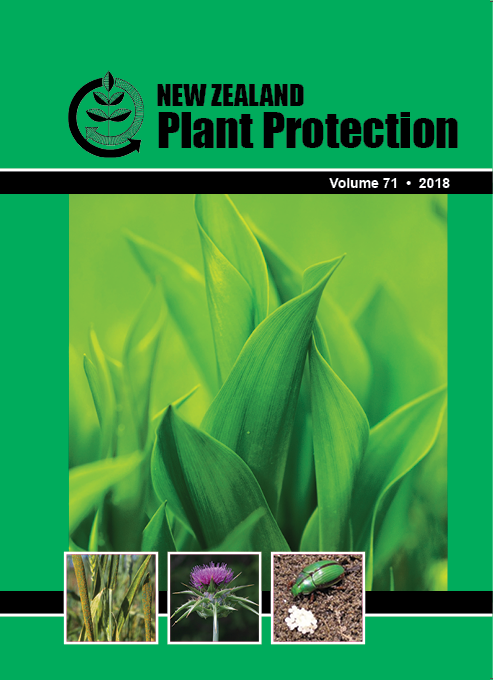 To date, these have included decision support tools for apple scab, downy mildew in onions, botrytis in grapes and more recently Psa in kiwifruit. He has also developed prediction models for climatic risk of invasive pathogens (potato wart disease and myrtle rust) and for the impacts of climate change on crop diseases. Recognising the importance of climate and weather in affecting plant diseases, Rob has, for many years, championed a network of weather stations in the key horticultural districts throughout New Zealand to generate data for the decision-support tools. It has been a struggle to keep the network running against shortages of funding and the frequent need to re-assert the value of the network to New Zealand horticulture. Rob has built a team of equally committed colleagues who share this understanding and, through tenacity and persistence, have recently achieved an upgrade of the entire network to internet-based communication systems. It is through his close collaborations over many years with the software company HortPlus that his decision support tools have been delivered to the commercial arena. Rob was a member of the New Zealand team that argued the case at the World Trade Organisation for the easing of restrictions on New Zealand apples entering Australia. Rob’s superior skills in interpreting climate data, in this case Australian data, in terms of pathogen survival, establishment and spread, and his clarity in presenting the results were instrumental in the success of that case in 2010. In parallel with Rob’s epidemiological strategy to reduce fungicide use is his interest in the threat of pathogens developing resistance to fungicides. Rob leads research to identify resistance threats to fungicides and also provides liaison between grower associations and agrochemical companies to design and implement robust resistance-management strategies. His focus on resistance started in 2005 when he published updated management strategies for all nine of the then available fungicide groups for the New Zealand Plant Protection Society (NZPPS). In 2007, he re-established the New Zealand Committee on Pesticide Resistance (NZCPR) (which had been in abeyance for 10 years) and chaired the committee’s work on fungicides, insecticides and herbicides from 2007 to 2012. He stepped aside to become NZCPR Science Advisor in 2012 so he could focus on resistance research. Following devastating disease outbreaks of apple scab (Venturia ineaqualis) in the pipfruit industry in 2009, Rob initiated a research programme with Pipfruit New Zealand that showed the cause of the outbreaks to be resistance to two groups of fungicides in use at the time. He has recently coordinated resistance strategy updates for botrytis affecting the wine industry, for summer fruit diseases and is currently leading a programme to monitor resistance of grape powdery mildew to key groups of fungicides. Rob was awarded the 2014 Plant & Food Research Chairman’s Award for his work on fungicide resistance. Rob is an effective communicator at all levels from heavy science to grower forums and is always willing to share his time, skills and knowledge. He has been involved with undergraduate lecturing for many years and has successfully supervised several PhDs.